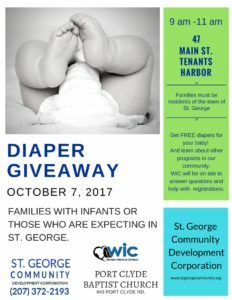 The St. George Community Development Corporation with the Port Clyde Baptist Church hosted a Diaper Give Away to distribute free diapers to families and expectant families in the town of St. George. WIC was also on site to answer questions and help with WIC registrations. The distribution began at 9 am and continued for the day. For our first diaper distribution, this wasn’t an entire crash and burn, but it also wasn’t a huge success. We still had plenty of diapers at the end of the day. We recorded our thoughts on the why factor. Is it because we are a new organization? Did we not market the give away enough? Is this not a need in our community? Was it the location we used for the distribution? To test our answers to these insightful project questions, we took the remaining diapers and placed them at the St. George School during the school’s Spring Open House and Spaghetti Supper. We arranged them in a large stack below a table with a sign that said: “Free Diapers, Please Take Some”. There were no humans hovering about. Minimal oversight of who took what. At the end of the event, more than half of the diapers had been taken. That was the success we were looking for! To top it off, the next week, the St. George Community Development Office received phone calls from two local families inquiring if there were additional diapers available and how they could acquire them. Big Success! While we don’t exactly plan to have a future Diaper Giveaway, we will have diapers available in our Food Pantry when it launches in 2018.